SAN ANTONIO -- Only Dwyane Wade knows the morning soreness, the annoyance of those midnight ice wraps and the discomfort and risk of whatever he's putting on or in the knee that's been failing him for months now, just so he can play. So only he could properly and deeply savor another moment in the Finals sun Thursday night, a performance for his personal Mount Rushmore. That's what Game 4 was, a pinnacle in Wade's already storied career, the degree of difficulty on his 32 points, six rebounds, four assists and six game-altering steals so much greater than the healthier halcyon days of 2006. AP Photo/Eric Gay Dwyane Wade did not fade in the second half, dominating the Spurs in Game 4 instead. With his hand covering his eyes and his head bowed, Wade had a private moment to appreciate it late in the night. Sitting in the corner of the locker room alone, Wade's left foot was in a bucket as both knees were wrapped tightly with ice. Another wrap was around his left hip, a fresh wound as the result of a collision with Tim Duncan. He even needed a Band-Aid to treat a cut on his left arm. So much of Wade's career has been a battle with his health. But so much of it, too, has been excelling at the highest level, this time of year. Sometimes it can be hard to remember it until, in a whoosh as unexpected as it was prodigious, he reaffirms his place in history. "Yeah, I needed a game like this," Wade said. "No, I don't feel like it's 2006. But it felt good." The Miami Heat's star trio was about as impressive as it can get under such high-pressure circumstances in Game 4, combining for 85 points, 30 rebounds, nine assists, 10 steals, five blocks and 37-of-64 shooting to overwhelm the San Antonio Spurs 109-93 and even the Finals at 2-2. You can plug those stat thresholds into the database and get numerous reports on how it's been the first time since a certain date Wade, Chris Bosh and LeBron James have reached those types of heights. But ignore the technical details for now and just know that with the Spurs on the verge of knocking them to the canvas, the Heat's stars together played their best game in months and one of the better playoff games they collectively delivered in their three years together. It was truly an "oh" game. Like "Oh, that's why this team won the title last season." Or "Oh, that's how they won 27 games in a row." Most appropriately, though, it was "Oh, that's the Wade who's going into the Hall of Fame." After getting totally outclassed in Game 3 when the Spurs smashed them in every way known to measure, the Heat knew they needed to play with a certain level of desperation. It was a tip of the cap to the Spurs, who had been hitting them with such depth and such a complete and disciplined game plan that it sobered them. It got James to use the dangerous "guarantee" word when promising a better performance. And James certainly backed that particular statement up, easily playing his best game of the series with an angry 33 points and 11 rebounds. He played with as much force as he played with weakness two nights earlier when he'd dipped into the malaise zone that was kicking up rumors on the Internet again. James responded to his dud by not only claiming responsibility but leaving himself no outs by declaring without qualification that he'd return to dominance. Then he actually backed it up. That's the sort of storyline that fans find delicious. Yet even with James' sphere of attention and limitless gravitas, that classic coming-through-in-the-clutch display still took a second seat to Wade and his vintage show of twisting drives, passing-lane interceptions and Eurostep slam dunks. That sort of says it all. James put on some show under enormous pressure that he freely added to himself. And Wade still stole it. "No matter how great you are, no matter what your résumé is, to have a game like this," James said about what he saw from Wade before pausing, "it lets you know you're still one bad -- you know the next two words." Let's just say Wade made like Samuel L. Jackson in "Pulp Fiction," wallet and all. "My teammates needed this game from me," Wade said. "They needed me." Encuentra lo más reciente de las finales de la NBA en español en ESPNDeportes.com. Last year, Wade got his "bad" knee drained over and over so he could get through the season and playoffs. He gave up an Olympic gold medal because he had to have surgery. Now another knee issue has mostly robbed him of something even more valuable: his ability to be great every night like he was making his name. But he'll always have this one, and it's quite a feather for the cap. You could see it in Wade's reactions as he was doing it: the little fist pumps, the smirking head nods, the cursing. He was cheering himself on, he couldn't help it. It did, after all, save the Heat's season and turned this into a three-game series that continues to look like it could be a series to remember. "If we go down 3-1, it's tough to climb back out of that hole," Wade said. "So to respond, that's kind of what you're going to be judged as a man. I thought my team responded well. I responded well." MVP: Dwyane Wade entered Game 4 badgered by injuries and doubts, playing at maybe the lowest level of his career. He exited it in better shape. The veteran was dynamic on both ends Thursday, scoring a playoff-high 32 points and notching six steals. X factor: Miami's Big Three. LeBron James, Wade and Chris Bosh -- collectively quiet as church mice in the series' first three tilts -- earned their moniker in Game 4. The trio combined for 85 points, 37 more than their previous series high, plus 30 rebounds and 10 dimes. That was ... a tale of two halves: Tony Parker, ostensibly hamstrung by a leg injury, was electric in the first half, penetrating at will and dicing the Heat to the tune of 15 points and six assists. The second frame was a different story: Parker missed each of his four shots and failed to score a point. That's the way Pat Riley probably envisioned it all coming together back in 2010. They were eight points shy of matching the entire Spurs team in scoring en route to a 109-93 win in Game 4. Manu Ginobili, Spurs: Spent 26 minutes on the court and when he did, things did not go well for the Spurs. Manu posted a game-worst minus-22 plus/minus in the Game 4 loss. 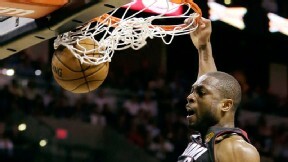 Maybe Manu can take a page out of D-Wade's rebirth playbook for Game 5 on Sunday night. "He was '06 Flash and we needed every bit of it." 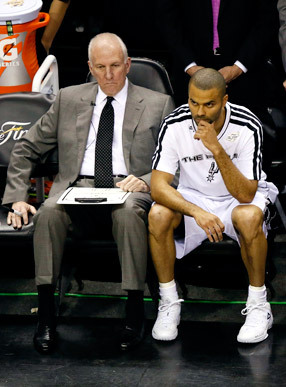 Soobum Im/USA TODAY Sports The best-laid plans of Gregg Popovich and Tony Parker could not deliver a win in Game 4. LeBron James scored 33 points, Dwyane Wade 32, and Chris Bosh 20 as the Big Three arose to even the NBA Finals at two wins apiece with a 109-93 win at San Antonio. It was the first time in the Finals that two players scored 30 points and a teammate added 20 since Game 2 of the 1995 Finals, when the Rockets defeated the Magic behind Hakeem Olajuwon (34), Sam Cassell (31) and Clyde Drexler (23). But it wasn't just the accumulation of points for Miami's Big Three; it was the efficiency with which those points were scored. James shot 15-for-25 from the floor, Wade 14-for-25, and Bosh 8-for-14. There have been only two other games in NBA Finals history in which two players scored 30 points and a teammate added 20, with each of the three hitting at least half of his field-goal attempts: In Game 2 of the 1969 Finals, the Lakers got that kind of contribution from Jerry West, Elgin Baylor and Johnny Egan; and in Game 5 of the 1985 Finals, the Lakers got similar numbers from Kareem Abdul-Jabbar, James Worthy and Magic Johnson.